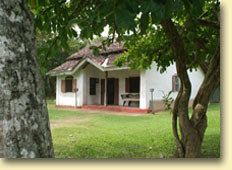 The house in which Martin Wickramasinghe was born has inspired the Martin Wickramasinghe Trust to established a Folk Museum Complex, surrounded by a restored ecosystem planted with hundreds of varieties of indigenous trees and shrubs in which bird life abounds. The house and the surroundings brings to life a little part of the Koggala which is so vividly depicted in Wickramasinghe’s writings. Martin Wickramasinghe was born, in the village of Malalgama in 1890. A section of the ancestral home, in which he and his sisters grew up with their parents has survived the rigors of time. The partly renovated house, part of the rear section of which is thought to be nearly 200 years old, is a typical southern abode of the period, with pleasing Dutch architectural features and cool, whitewashed walls and floors paved with square bricks. Wickramasinghe’s house miraculously escaped the fate of others in his village. The story goes that this simple house with its subdued architecture caught the eye of a female Air Force officer, and she made it her residence during the military occupation of the area, ensuring its preservation. It was a Catalina aircraft from this base which alerted the British government to the presence of a Japanese fleet, thus ensuring that adequate defensive measures were taken by the military to ward off an attack. The grass covered mound to the right of the house holds his ashes, surmounted by a wedge-shaped rock from the Koggala reef, on which he spent many hours of his day during his childhood. The ashes of his wife Prema are also buried under this mound. An exhibition of memorabilia is housed in a Hall of Life. The Hall of Life tells the story of Wickramasinghe’s life through a series of photographs, awards and souvenirs. The Folk Museum was long a desire of the author who wanted to recapture within it the technological and cultural artifacts which were a familiar part of his childhood. The various objects of folk culture acquired during his lifetime have been the starting point of the collection found in the museum, which was opened in 1981. 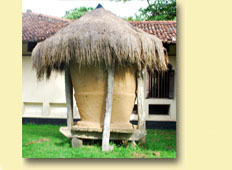 The Wickramasinghe Trust has developed the museum into a growing repository of artifacts depicting the history of Sri Lankan folk culture, from ancient to modern times in order to remind the people of Sri Lanka of their living roots. The museum is a fascinating collection of artifacts, from Buddhist artifacts to those which portray the development of rural technology in agriculture, agro industry, fishing, pottery and metal craft artifacts, various artifacts from folk dances and religious ceremonies and many others. 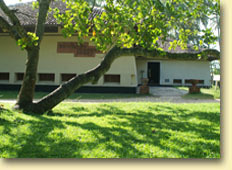 Tastefully presented, the museum offers visitors rare insights into Sri Lankan folk culture. 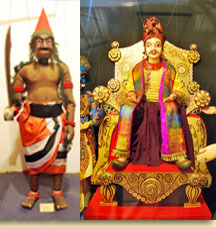 In providing the backdrop and context to the museum, a Trust brochure states that “Martin Wickramasinghe delved into the life and culture of our people from their early beginning to the present day and through his writings, he identified our folk culture as a resilient bonding substance which has not only prevented our social disintegration and alienation, despite assimilation of elements from a multitude of eastern and western cultures, but also moulded our collective identity and values as a people. Wickramasinghe’s unceasing intellectual exploration and his creative and critical writings relating to the life and culture of the people of Sri Lanka continued for a period of over 70 years”. The Folk museum is an ideal place to get to know the author better, to understand a little of what Koggala and its people meant to him. Wickramasinghe’s writings vividly recall the carefree days of his childhood, exploring the marine life in the Koggala reef, playing with his friends from the village and enjoying the rural solitude of his beloved Koggala. Seated on the steps of Wickramasinghe’s ancestral home, and enjoying the blessed charm of this seven acre piece of rural paradise, it is easy to understand why this piece of earth nurtured and set ablaze the imagination of one of this country’s greatest writers.